In 2012, KEYS 4 HealthyKids communities created walking trails and parks, grew vegetables in creative ways, upgraded a food pantry menu, started a farmers market and worked with more than 800 Kanawha County kids. Now the organization is expanding to nine other counties. CHARLESTON, W.Va. — In 2012, KEYS 4 HealthyKids groups created walking trails and parks, grew vegetables in creative ways, upgraded a food pantry menu, started a farmers market and worked with more than 800 Kanawha County kids. Now the organization is expanding to nine other counties. “We’re looking for 10 groups of people that want to work together to improve the health of their communities,” said pediatrician Dr. Jamie Jeffrey, the group’s director. Next month, KEYS 4 HealthyKids will award grants and technical support to communities in the nine counties that border Kanawha County: Boone, Clay, Fayette, Jackson, Lincoln, Nicholas, Putnam, Raleigh and Roane. “Eventually, we’d like to take this statewide,” Jeffrey said. KEYS groups create projects ranging from community gardening projects, walking trails and biking lanes to health plans for the whole community. So far, A Healthy Clendenin, created with a KEYS grant, has created a community walking trail, secured a land donation for a new city park, started a farmers market and worked with schoolkids on nutrition, Jeffrey said. “When projects are created by a community process like this, they’re more likely to last,” Jeffrey said. The ten new communities will learn a step-by-step process that helps communities form partnerships, assess strengths and weaknesses, and make a plan for going forward, she said. They will use the KEYS strategy toolkit, tested on 2012 projects. Jeffrey, medical director of the Children’s Medicine Center at Women and Children’s Hospital, started KEYS in 2010 with a Robert Wood Johnson grant to help communities lower children’s risk of obesity, diabetes and heart disease through better diet and more physical activity. 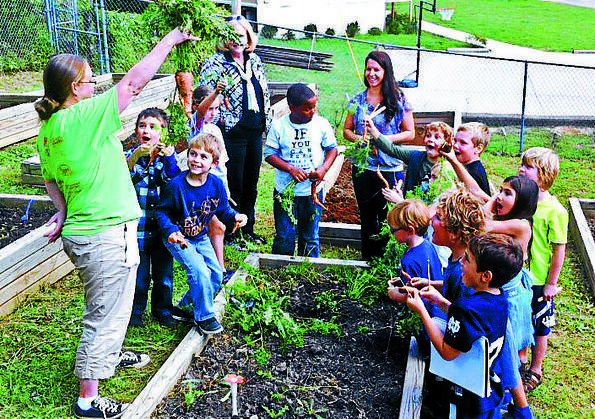 In Kanawha County, the 2013 KEYS spring garden project will involve 26 schools. The 2013 projects will be funded by the Claude Worthington Benedum Foundation, among others. “This is how change happens, step by step, community by community, communities helping each other,” Crabtree said. Grant applications are due April 19. For information, visit www.keys4healthykids.com or call 304-388-7145. Reach Kate Long at 304-343-1884 or kate_long@hotmail.com. “The Shape We’re In” has been partially funded by a Dennis A. Hunt Fund for Health Journalism fellowship, administered by the California Endowment Health Journalism Fellowships at the University of Southern California’s Annenberg School for Communication and Journalism. This entry was posted in Diabetes, Obesity/ chronic disease, School efforts to lower the numbers, Stories about community programs. Bookmark the permalink.